Burning Wins is a simple 3 x 3 slot game with a 96.21% RTP slot by the developer Playson. There are no bonus rounds or free spins in this classic online slot UK. There are so many games that share a lot of features and themes. All these slots are equally entertaining and not to mention with a great and remarkable theme. All these games may have similar features and other technical descriptions, but many of these games manage to stand out only because of the fact that they attend to the players and how they want the game to direct their attention. Most importantly, the theme and the basic background of the game is the most important bit which represents every slot online. While there are many games that have different themes, there is nothing wrong in saying that the games present online have their own attitude. This sort of attitude is represented by whatever the game offers through its theme and ideas. For instance, there are many games that could entertain movie buffs if they are into movies and all about whatever goes into making movies. Some are inspired by fantasies and find their perfect idea of a game in themes related to pixies, fairies, and demons. There are slots that are based on cowboys, sports, animals etc. There are slots of all kinds, and most importantly, they are entertaining and amazing to play. All it really needs is the player’s utmost attention and the game can be played with joy, entertainment, and fulfilment. There are, however, still many games that manage to find their way in a more simplistic theme. Those games barely manage to focus on the bigger things that a lot of games have to offer. For instance, there are many games that offer a lot of featured rounds, bonus games, not to mention new levels of the game. It’s almost like playing another game in a slot game. It cannot be termed crazy but certainly creative. Many players enjoy that sort of idea where they are not limited to just spinning and playing. For some players, that might not be quite true. There are some players who only like games for being simple, yet entertaining. That is, they are not interested in the featured content of the game and how much it has to offer to the player, or that how many games are present within the slot. For some players, it is all about spinning and taking their time to see where their luck will take them. Burning Wins was developed by Playson and is like one of those not so rare but not so common games with a simple theme. The game is exactly like a modern version of fruit slot machine. The technical features, as it will be discussed are just like the old-school versions of fruit slot, but only that they are more exciting and entertaining to play. Slots can be minimal and could just make the player stick to the basics, but it all depends on the player and how she/he manages to make the most out of the game. Burning Wins is not just a simplistic sort of slot, but can also allow the player to try their luck and if done in the right direction, they can surely win a lot and have their luck win for them so many exciting rewards. Here are a few things you should know about the game. Burning Wins by Playson comes with an RTP of 96.21%. The sort of RTP this game offers says a lot about the game and is guaranteed to make the player feel worth being lucky. This game has a 3 x 3 reel and therefore holds a very classical approach as much as the gameplay goes. One of the things about this game that may not come as a surprise is that this game only offers a payline of 5. Moving on to the more technical part of the game, the symbols used in this game are 777, Bells, Bar Bar, Watermelon, Grapes, Plum, Lemon, Orange, and Cherries. Starting only with the smallest reward, Burning Wins can let you win 700 only if you manage to get 3 cherry symbols in the payline. The same reward applies for Cherry, Orange, Lemon, and Plums. The game gets better when Watermelon and Lemon symbols are used. That’s when the game can offer 1500 rewards for being found 3 times in the payline. The Bar Bar Symbol can offer 2000, and the bells symbol can let the player 4000 points. Lastly, the greatest reward lies in the 777 symbols, and that is where the player has the ability to win 6000 points if found thrice in the payline. There are so many games that can be associated with Burning Wins. It’s not just about being simplistic but also coming close to the theme. Some of the games that come in this category are Fruit Machines and Classic Fruit Slot. Fruit Machines cannot only be easily found anywhere online but is one of those simple fruit slots that can manage to take anyone’s choice of a great simple slot. It’s games like these and Classic Fruit slot that manage to make and take it all as far as rewards for having a simplified slot goes. Super Burning Wins slot also manages to get the same description, as well as, the equal entertainment. There are so many games that manage to come close to Burning Wins with respect to features. One of the most interesting games that can come close to Burning Wins with respect to RTP is Revenge Of Cyborgs. The game is not only entertaining but as far as the features go, strictly speaking, the game manages to have it all. Rainbow Wilds slot also manages to not only offer the same RTP as Burning Wins but also has a somewhat striking resemblance with Burning Wins, as far as fruit theme slots are concerned. If you are interested in games just like Burning Wins or games similar to Burning Wins, you can always visit Moneyreels.com and check out the video below. Revisit simpler times with the 3 x 3 grid traditional set up of the online slot by Playson which offers an RTP rate of 96.21 over 5 different bet lines. Play Burning Wins on Money Reels today which is home to over 550+ slot games. Remember the good old days when things were kept simple? The game designer behind the uniquely practical online slot Burning Wins certainly haven’t forgotten as they proved with the release of their ever-popular online slot. Playson were very well aware that there were numerous online slots published online that used a unique selling point of simplicity which is why they stepped up their game with Burning Wins. Playson recognised that fancy bonus rounds and excessive cut scenes which interrupt the gameplay experience aren’t for every online slot game. Instead, the reel spinning action is non-stop with Burning Wins. As many players will have noticed when it comes to licenced games which are themed based on films, TV shows or bands, the RTP always tends to be higher with these games. So, it pays to keep it simple with a basic online slot which still offers plenty of exhilaration and excitement. That being said, the licenced games all carry their own unique appeal, and the perfect online slot will be different for every player. Money Reels has ensured that all players find what intrigues them represented through a game – if find that Burning Wins for you, look through our collection of action, fantasy, history, and mythology themed games. We’ll make sure that we paint an avid picture of the gameplay experience to Burning Wins to allow you to make sure that you know where your money is based placed when it comes to simple online slots. We’ll touch on the more technical side of the game, but if you’re new to playing slots, the rules are easy to learn – that’s just one of the reasons why so many people log in and play online slots on Money Reels every day. The success of Burning Wins no doubt has something to do with the ability of the game to appeal to the players and pre-empt the direction of their attention as they start to play the games. The theme and the layout of the online slot are strikingly similar to your average land-based slot machine which will show you 3 reels and 3 rows spinning with symbols which you have become familiar with on the one-armed bandits. Yet, to make sure that the gameplay experience is as enjoyable as possible, you’ll still want to run through how each of the symbols can help you to cash out big. Throughout their history, Playson have proven to have a talent when it comes to ultra-modern games which carry a simple theme. It made sense for Playson to reflect the set up of a land-based slot machine. It gives players who are only just breaking away from land-based slots and discovering the excitement of playing a slot game through an online casino the opportunity to lightly dip their toes in the water. The first thing which land-based slot players will appreciate about online slots is the size of the jackpots which will definitely give your favourite one-armed bandit a run for its money. Although online slots have the ability to pack in a range of bonus features such as side games away from the main play, you will find the set up of Burning Wins simple and understated, yet infinitely entertaining. The average return to player rate of the game is set to a generous 96.21%, this is significantly higher than what most games offer in terms of return to player rate. But the higher return to player rates tends to be a common feature with the simpler slots which constantly reward the customer who has spun the reels to enjoy feeling lucky. The layout of the reels has been inspired by the traditional slot machines with a classic 3 x 3 reel approach. Whilst with most online slots you will more commonly find 3 reels and 5 rows, but now, reels are offered in all shapes and forms such as with cascade reels and pyramid-shaped reels. There are 5 different pay lines with Burning Wins which is fairly low in comparison to most games on Money Reels – yet, this should come as no surprise given the simplicity of the game. 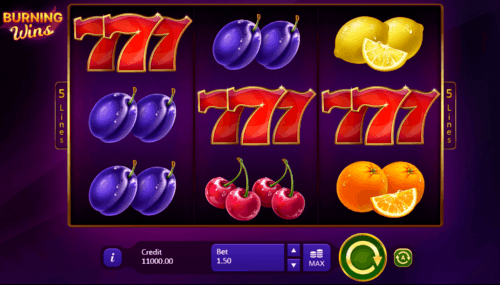 The symbols which you can expect to see appearing on the reels are bells, Bar Bar, Lemons, Oranges, Cherries, Grapes, Plums, Watermelons and of course 777 to complete the classic set of the land-based slot machine. As previously mentioned in the Burning Wins overview, there aren’t all too many bonus features in comparison to other online slots, but that’s not to say you don’t have the ability to cash out regularly and significantly with the slot! The smallest reward which can be earned on Burning Wins is done so by matching three of the cherry, orange, lemon or plum symbols on a pay line – this will win you 700 coins. The rewards get more significant in the presence of the watermelon and lemon symbols, when you match three watermelons or lemons on a pay line, you will be able to win up to 1500 coins. Matching three Bar Bar symbols on a line can win you 2000 coins and the bells symbol can offer 4000. Yet, the one which you’ll really want to watch out for in the Burning Wins online slot is the 777 symbols. If you’re lucky enough to land three of those on any of the 5 pay lines, you’ll cash out on the jackpot prize of 6000 points! Playson are a relatively fresh face for the software development industry. But that hasn’t stopped them from releasing some of the most innovative games on the market since their inception in 2012. Their thematic approach to creating progressive and simple slot games hasn’t gone unnoticed by game reviewers, awarding bodies and players alike. They may only have around 40+ games on their portfolio (at the end of 2018). Yet with their prolific publication rate, it looks likely that there will be a fair amount of games to be released in the future; all produced with their high-tech gear with the ability to create stunning HD graphics. The Malta-based tech company has already seen its organisation grow, with representatives all across the globe – players are also spinning their reels worldwide too as they endeavour to make online gambling a safe and enjoyable experience. Three years after their inception in 2015, Playson was granted a UKGC licence which allowed their games to be played by online slot players in the UK. As the UK accounts for a big majority of the online slot industry’s income – this saw Playson come forward as one of the more legitimate game developers around today. Playson describes their approach to gaming as “complete gaming solutions……..as well as custom game design for the most ambitious of operators looking to build a differentiated product offering”. Sounds good, right? But what does it actually mean? Essentially, it would come as no surprise if in the future we saw Playson team up with collaborating with other parties such as Pariplay and Leander Games. Even though the main focus of Playson’s current enterprise, they also use their expertise in many other modes of gaming. Alongside the 40+ online slot games on their portfolio they are also responsible for creating some of the most innovative video poker machines, and table games such as Roulette and Blackjack. Playson haven’t fallen short of online casinos to host their games either, along with Money Reels, you will be able to find Playson’s games on Rose Slots, Clover Casino and Amigo Slots. Up to now, they have over 40+ titles in their portfolio of HTML5 titles including the ever-popular Crystal Crush, Lucky Staxx: 40 Lines, Wild Warriors, Fruits & Jokers: 40 Lines and Book of Gold Double Chance. While there may still be a lack of big merchandise games on their books, they still have a unique way of appealing to players looking for a contemporary online slot experience. If that wasn’t enough to get you excited to play Burning Wins why not explore the similar games on offer from Playson down below. Super Burning Wins: Classic 5 Lines was released shortly after Burning Wins on August 7th, 2018. As you would expect from the name, Playson have put even more clever twists on their electronic version of the slot machine. Playson describe the game as “a great example of land-based [casino] experience brought online”. But what do the reviewers have to say about that? Some may have indicated that Super Burning Wins: Classic 5 Lines lacked imagination, yet, it gives 20 bet lines instead of 5 which is what Burning Wins offers. Super Burning Wins also comes with the added bonus of the 2x multiplier which is triggered by nine of the same fruit appearing on the reels at the same time. When this happens, all coins won on the spin will be doubled. So, in theory Super Burning Wins will be the perfect slot to move onto after you’ve got to grips with Burning Wins. If you’d prefer to stick with the 5 bet lines but explore different theme’s Joker Expand: 5 Lines is the perfect online slot to turn to. You’ll notice that Playson tend to run the same themed games with a variety of bet lines so it’s easy to navigate through the slot games until you find one that you are most comfortable playing. Joker Expand: 5 Lines was released shortly after Burning Wins and invites you into the carnival atmosphere with a jester as host. Pay close attention to what he has to say – he may just be willing to share a trick or two with you to help you win big on the slots. Instead of a 3x3 reel set up, Joker Expand: 5 Lines is a 3x5 reel set up which includes bonus features to jazz up the game play. The Joker symbol will appear as the Expanding Wild Symbol and you’ll find two Scatter symbols which include the Gold Star and Diamond Star. The rest of the symbols will pop up as fruits – instead of with letters or numbers. While Fruits and Stars slot isn’t exactly as graphically spectacular as their other games, the appeal can certainly be found in the exotic allure of the reels with a soundtrack which is soaked in Rio carnival vibes. The rich pickings of the winnings are pretty sweet too. The classic themed slot goes by the 5 x 3, 5 bet line set up which includes a Scatter symbol, making it much easier to snag a winning combination than with Burning Wins. If you’re looking to go retro, there’s probably no better option than Fruits and Stars. Along with the games published by Playson, not unsurprisingly many other game developers were keen to create their very own odes to the original slot machines. You can find a wide variety of the games on Money Reels impressive selection of 500+ online slot games. We’ve hand-picked the best alternatives for you if you’re fond of Burning Wins! If you like your online slot games hotter than most, 7s to Burn will undoubtedly become your next favourite classic slot machine themed game. 3 x 3 reel game has five bet lines – the same as with Burning Wins, yet this online slot packs in plenty of fiery animations to make the gameplay experience even more immersive. You’ll still see the same fruit symbols popping up on the reels, but you’ll also have the added advantage of the Hi Roller bonus feature. Triggering this feature will reward you with up to five extra free spins feature where the Burning 7s symbols will then act as a Wild. The return to player rate is slightly lower than with Burning Wins with a 95.1% RTP rate, yet, when you factor in the Wild card, that more than makes up for the RTP hit. Looking for simplicity? Many online slot players have found it by playing one of the UK’s most popular online slot games Rainbow Riches. With a slight twist to the classic theme, you’ll also enjoy the Irish charm which has been added to the game which features an ever-glistening rainbow in the background Yet, if that wasn’t enough to get you excited the 5 x 3 reel slot by Barcrest also offers 20 unique bet lines with each spin. If you’re playing on a budget, you’ll be pleased to know that you can place a stake from as little as 0.01 coins, going up to 20 coins. You’ll see your coins going a long way thanks to the Scatter symbol and the Wild symbol and three different bonus rounds. Yep, you read that right, three different bonus rounds which are generous enough to bestow upon you a whole host of prizes and rewards. Online slots don’t get friendlier or fluffier than Eyecon’s iconic (or should that be eyeconic?) video slot Fluffy Favourites. The online slot may be slightly more complex in comparison to Burning Wins with the 5 reels and 25 different bet lines, yet the amiably adorable animals are more than worth getting your head around the gameplay and the exciting bonus features which Fluffy Favourites has to offer. Both the mobile and the laptop version offer two different bonus rounds via the Money Reels website. This comes in the form of the ‘Toybox bonus’ and the free spins round. Fans of land-based arcades are sure to appreciate the Toybox round which requires you to pick out the Pink Elephant Wild card out of the grabber machine. The maximum prize which can be won with the toybox feature is 100x the total amount you put down when you spun the reels. Not bad, right? And all of that is combined with a return to player rate of 95.3% which is slightly less than what you’re offered with Burning Wins, yet, due to the innovative bonus features, Fluffy Favourites is still definitely worth a spin! Burning Wins is available to play via laptop and mobile through the Money Reels website along with the 550+ more games which are available to play through the app or website. Playson have ensured that their games are optimised for both desktop and mobile play. Good news for anyone who likes to spin the reels on their morning commute! 2018 was a big year for the software development company Playson after they signed with multiple online casinos worldwide including Jokerbet, Dench Solutions, Casino Gran Madrid, Circus.ES plus many, many more. They’ve also been keen to show off their skills at events such as Sigma. The event gave fans of the game the chance to drop by and show their appreciation for the unique creations cooked up by Playson and give their feedback on the already highly rated games.